Ansonia Clock Co. enameled iron case, "Nubia", ca 1894. 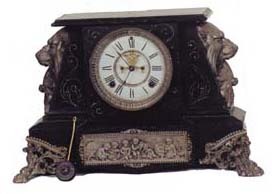 A large, heavy, iron clock, 17 inches wide and 11 inches high. There are silver ornaments such as the frieze at the base showing 7 school children. There are large paw feet and the huge end ornaments which are mythical dogs, lions, or whatever. One of many meanings of "Nubia" is black. I looked it up. Very good 2 piece porcelain dial with open escape, beveled glass.8 day movement strikes half hours on a gong, runs. The iron is chipped along some edges and the silver ornaments need to be cleaned. Ly-AnsoniaNo.1097.